Know where your products are stored and their locations. Optimize the handling and delivery of your orders. 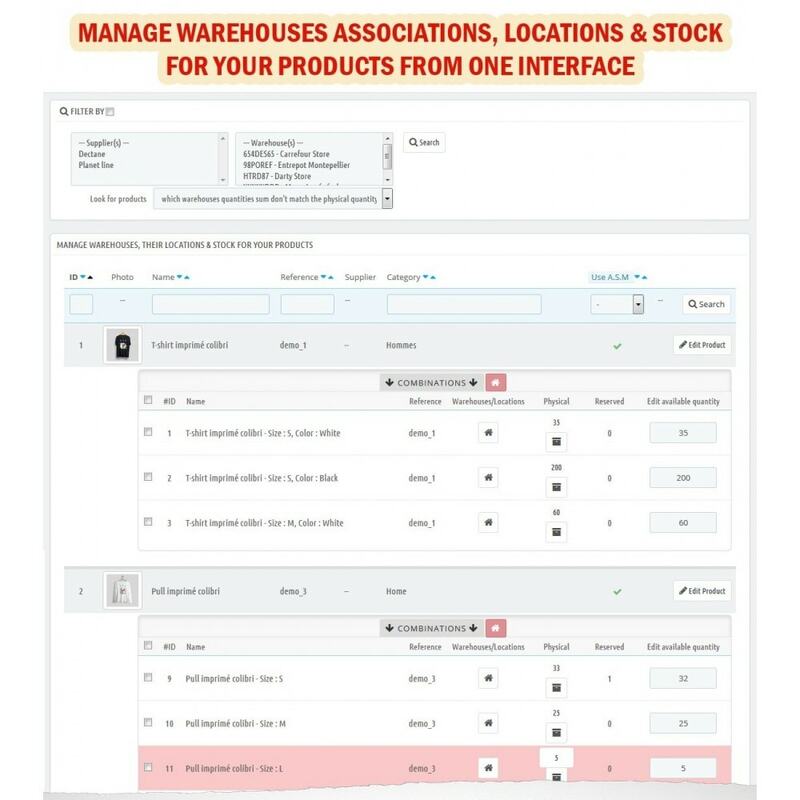 Improve catalog management: don't spend hours browsing between each product to manage warehouses associations : Help saving time! Each feature is managed entirely in one simple and intuitive interface, no need to reload the entire page: Gain more speed! Choose which carriers can ship orders from particular warehouses. 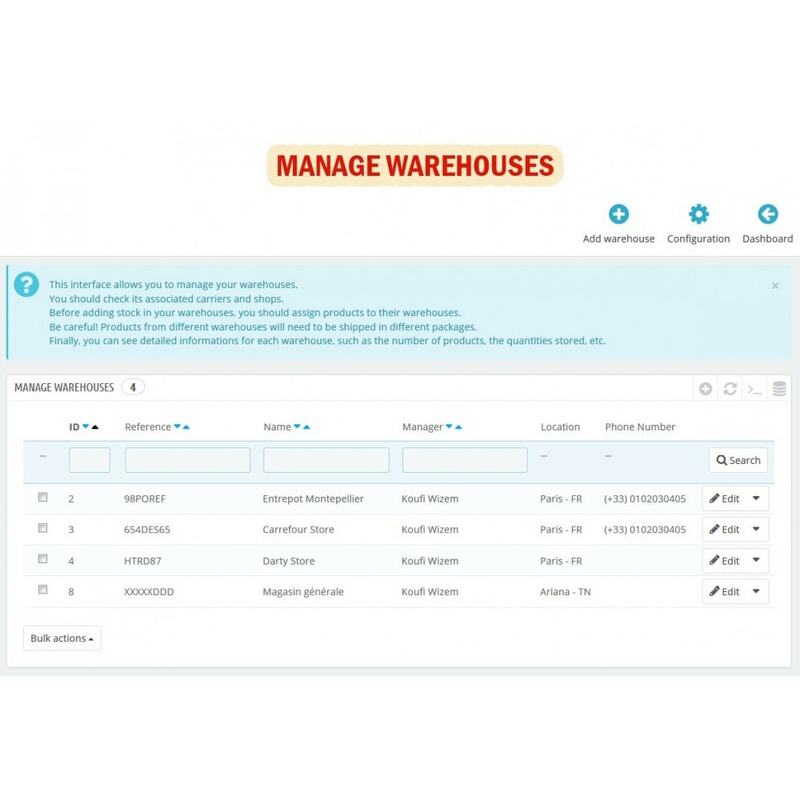 You can see detailed informations for each warehouse, such as the related products, number of products, the quantities stored, etc. Associate quickly products to warehouses. Dissociate quickly products from warehouses. Specify for each product/combination as it relates to warehouse location. Switch in bulk products to advanced stock management system. Manage stock for each product/combination and by warehouse. Filters are available to search products by suppliers / warehouses / categories / reference / advanced stock status / etc. You can easily look for products / combinations whose sum of quantities in warehouses does not match the available physical quantity (overall).Thus, it will be easy to correct the quantities gaps. 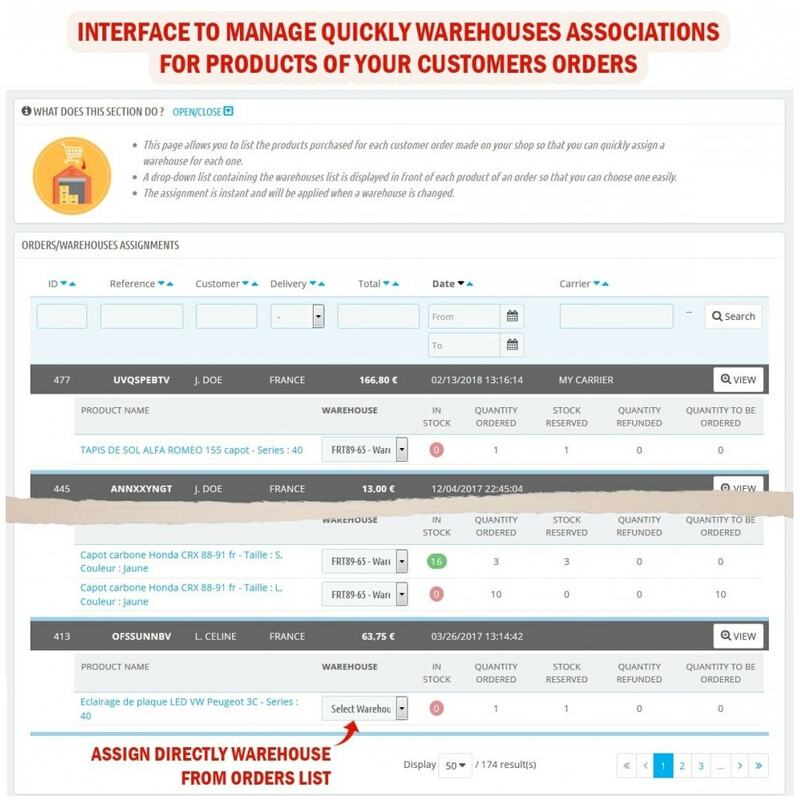 This section makes it easy to change or associate a nearest warehouse for each product in a customer's order to optimize the products shipping and thus save considerable time customers' deliveries. Option to set advanced stock management from the product sheet. Each quantity change triggers an automatic physical quantities synchronization between your shop and warehouses. 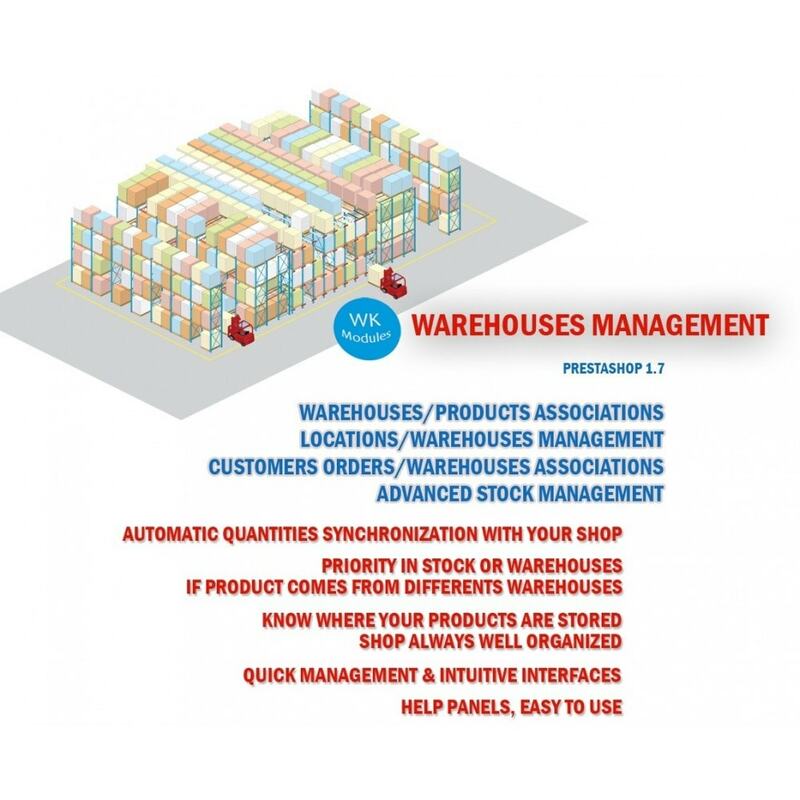 If product is from different warehouses and if stock movements are coming from any global quantities' changes, the synchronization will be based on stock priority (lowest quantity in stock selection) or warehouses priority (settings defined in the configuration page to determine which one should be updated in priority). Automatically set a default warehouse when new product is created. Set advanced stock management system by default when new product is created. Option to insert the location in warehouse of each product of customer order as additional information in Delivery Slip PDF document. 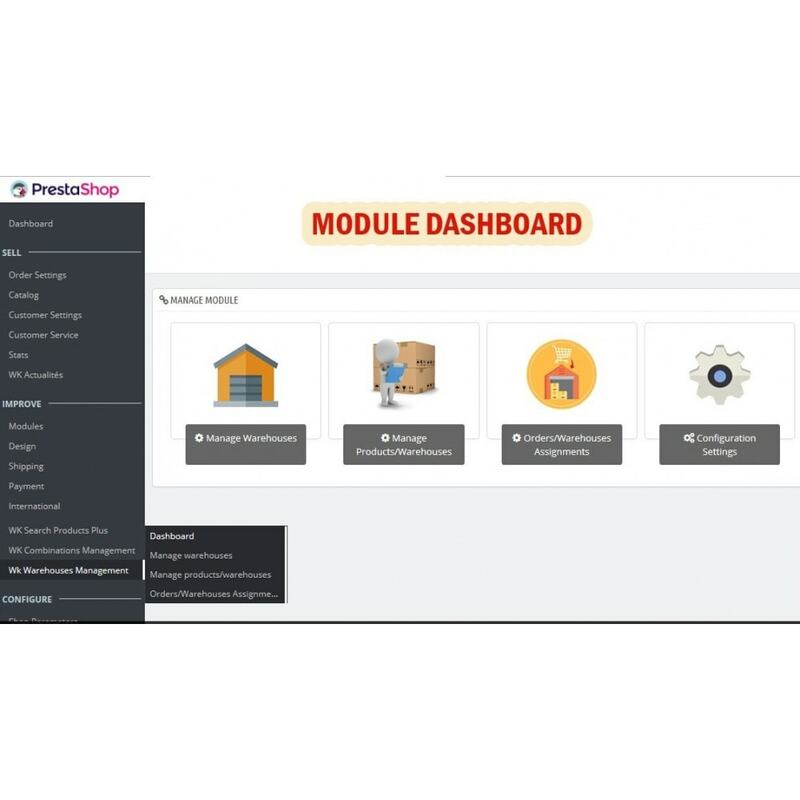 If you have any questions or problems with the module, click “Contact the developer”, we respond quickly and will do everything possible to solve your problem as soon as possible. Save stock movement (named : customer order) after payment process. Don't update warehouses stock after process payments (from frontoffice). Add new language : Italian. Add Prestashop 1.7.5 & PHP 7.2 compatibilities.